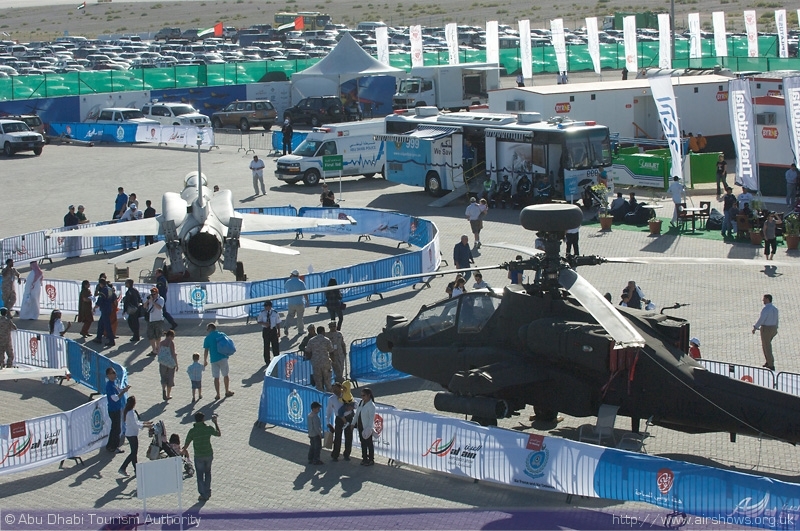 Al Ain Airfield, a combined regional airport and military training academy in the heart of the Abu Dhabi desert has made quite a name for itself in airshow circles. 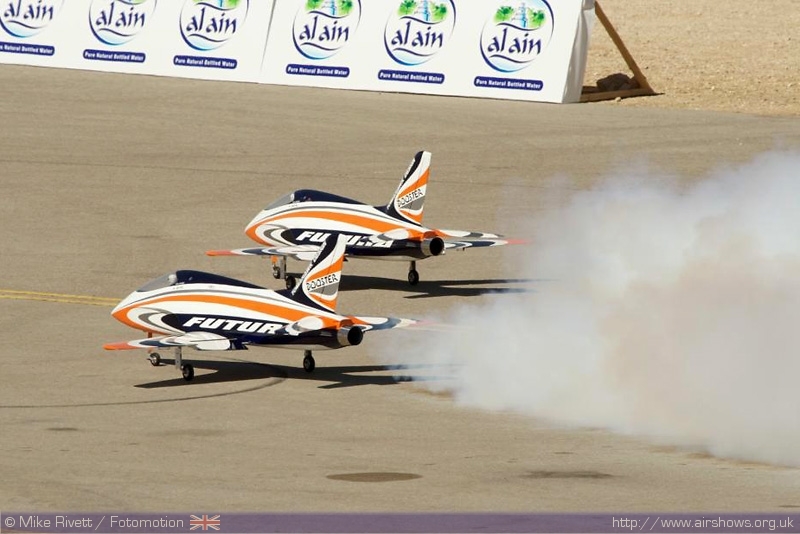 The Al Ain Aerobatic show is fast becoming a “must see show” for participants and spectators alike. 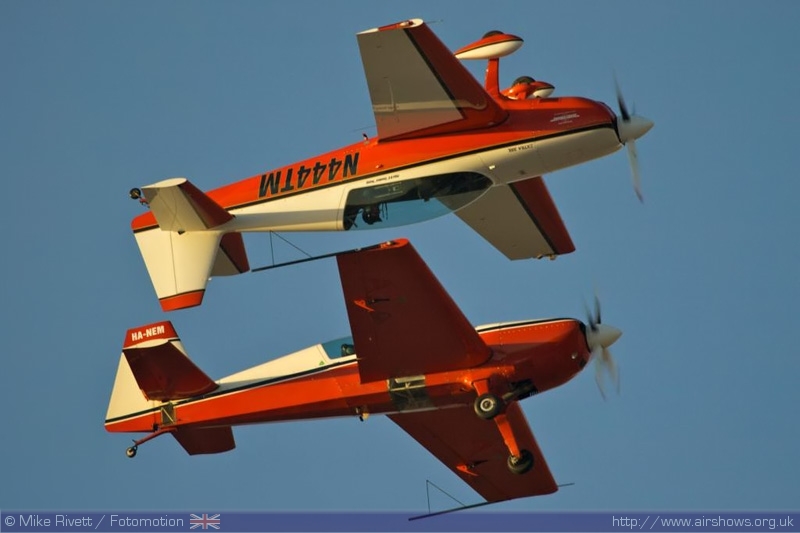 The early January date, the unusual location and unique combination of acts from around the world make the Aerobatics Show a very special event. 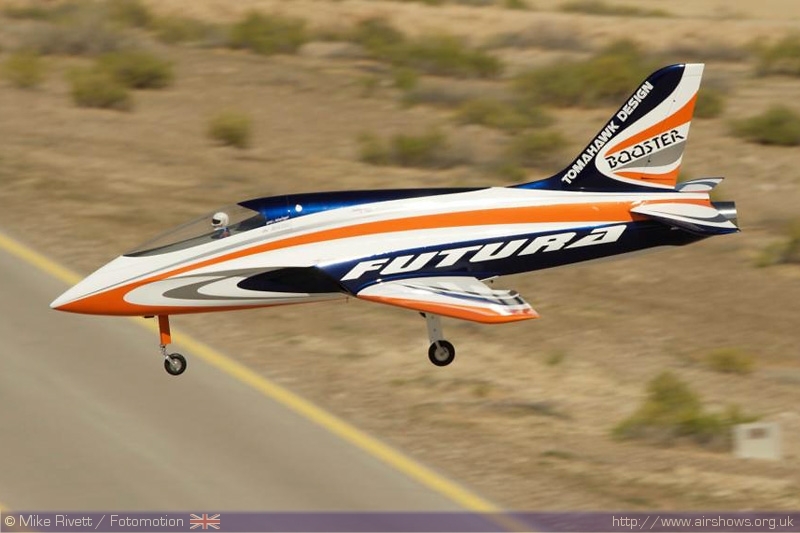 Mike Rivett/Fotomotion reports for Flightline UK. All photography copyright of Author unless stated. 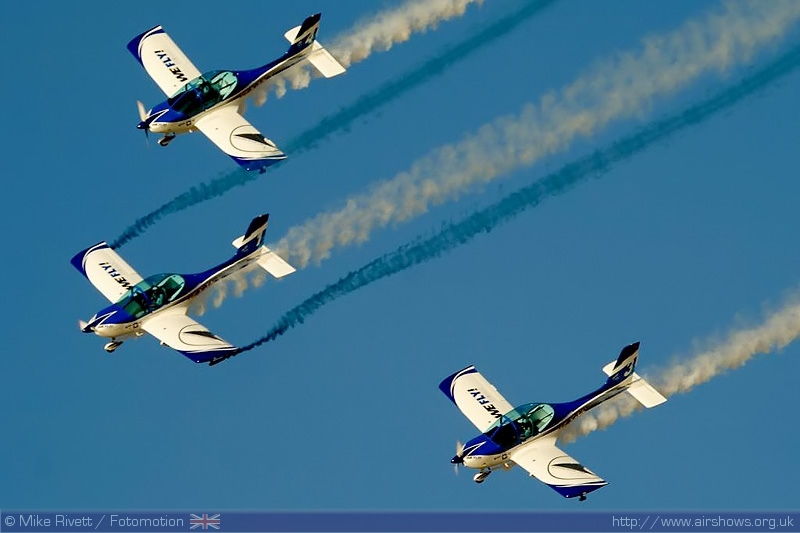 With an entrance fee of just AED 40 (around £6.50) the Al Ain Aerobatics Show certainly presents value for money when compared with the equivalent UK show. 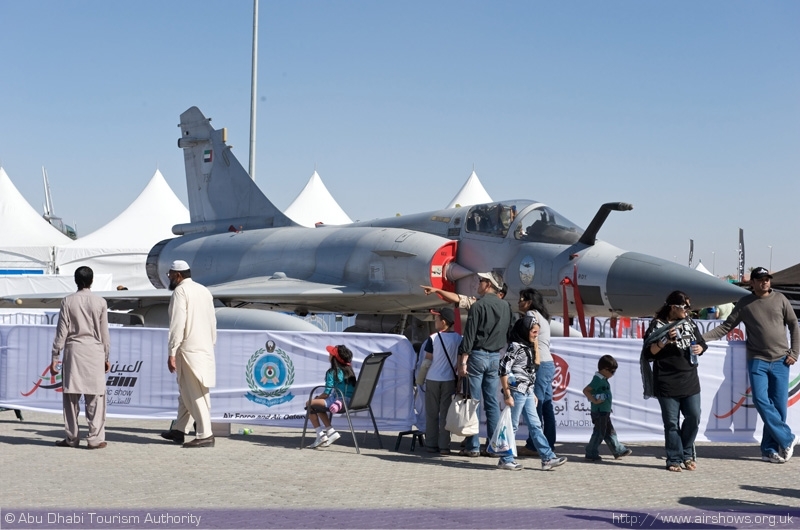 The show is supported by the Abu Dhabi Tourism Authority and the United Arab Emirates Air Force. 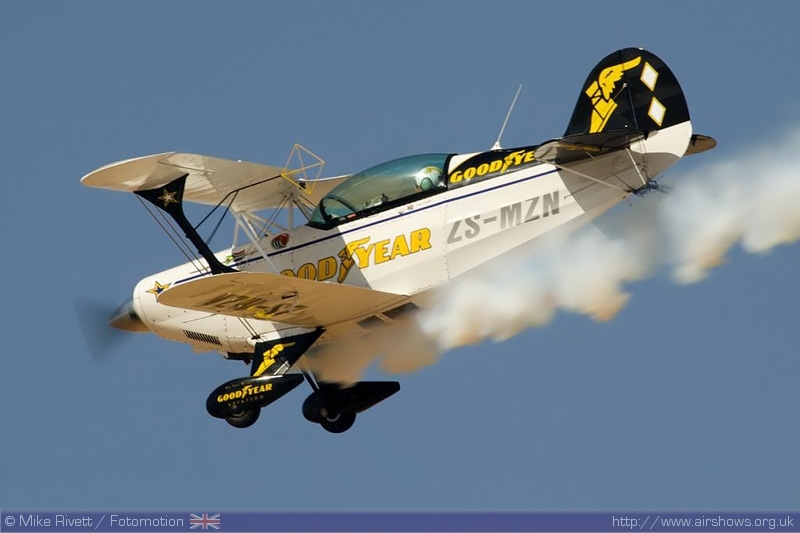 Like many shows, there are attractions on the ground as well as in the air, with a small showground with various stalls including some government sponsored exhibits and a large collection of police vehicles! 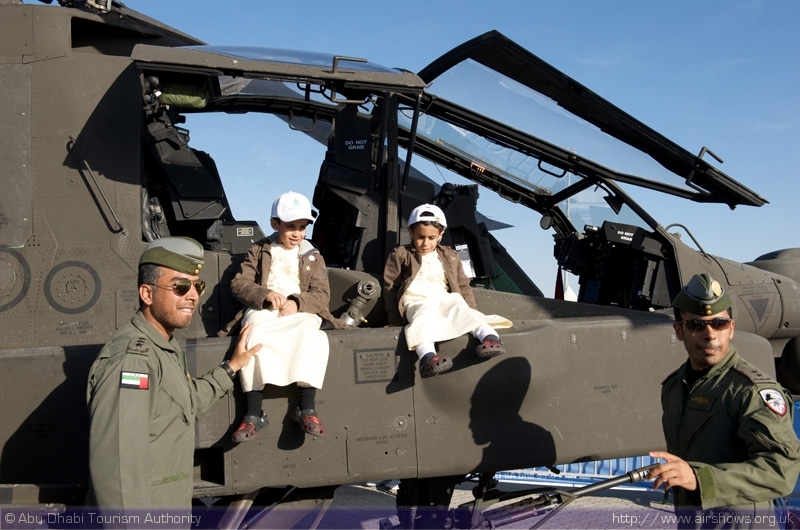 Static aircraft consisted of a UAEAF F-16E, AH-64D Apache, BAE Hawk, Mirage 2000, and UH-60 Blackhawk. The local aviation college also had their aircraft on show along with police and local authority aircraft. The crowdline for the flying ran along a taxiway, perpendicular to the main runway. This faces north allowing for some superb light for photography. The crowd line is dominated by the hospitality for sponsors and local dignitaries. The public watch the show from a free grandstand. The top row allows for a superb view of the flying, though early arrival is recommended to grab your spot! It wasn’t just aircraft on show, two stunt drivers showed what could be done with 2 powerful AMG Mercedes cars. Stunt driving is always a popular attraction for the local population who have a real passion for speed and noise! The flying displays started just after lunch with a mix of radio controlled model aircraft. When you think you have seen this before you realise the close proximity to the display line makes this a very different experience. One of the aircraft, the Harpoon, is capable of over 300kts. 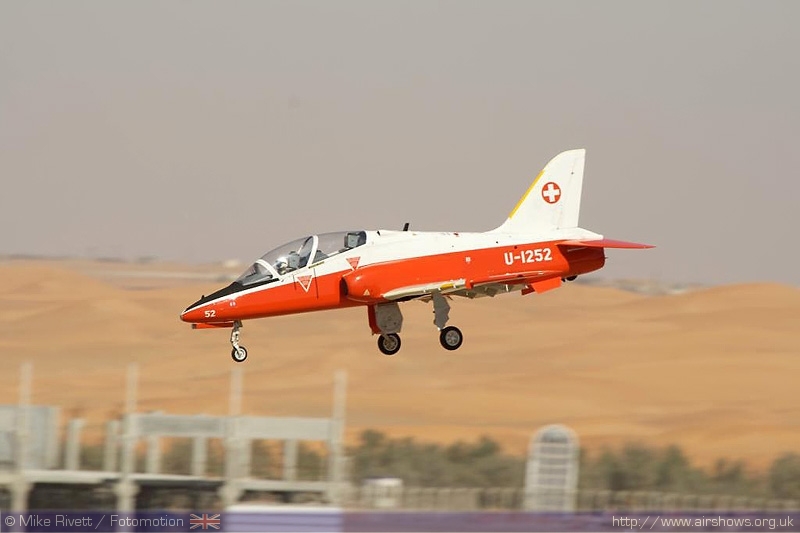 The scale aircraft were particularly impressive with a Hawk in Swiss Air Force colours as well as a UAEAF marked example. 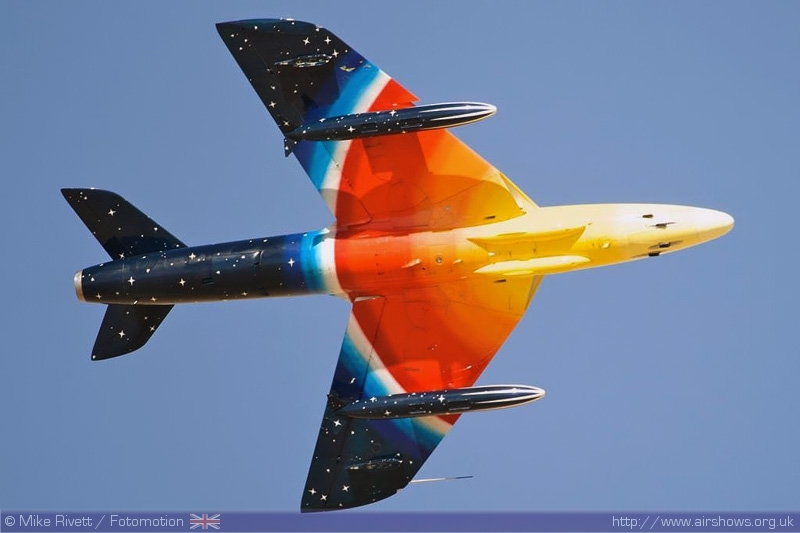 One model attracting particular attention was a Hunter which was a scale replica of Miss Demeanour, Jonathan Whalley’s colourful aircraft which would be seen for real later in the day. 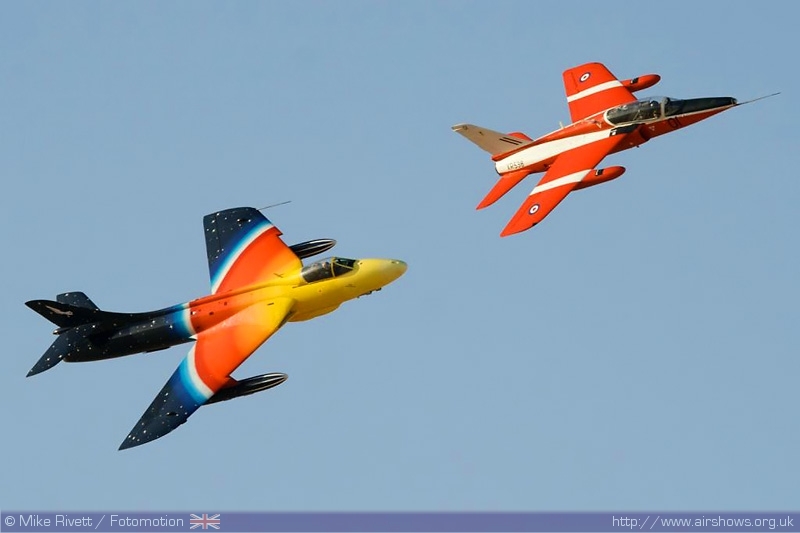 The authentic paint scheme retained the same level detail as the full sized aircraft. One thing the model Hunter had over the original was a smoke system which would be an excellent addition to the original! Something I have personally never seen before, all the way from Germany, were a team of model flyers flying two Futura kits in formation. 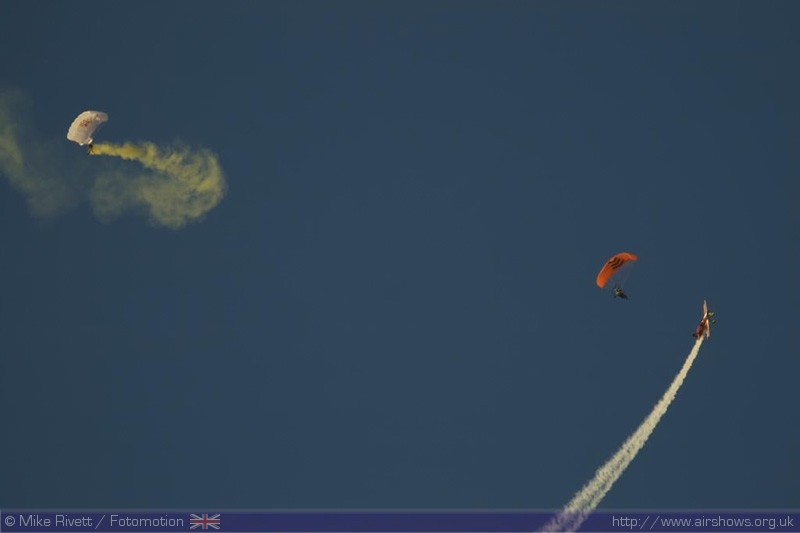 From a formation take off with smoke, the team performed a tail chase and even a heart in the blue sky! That's something we are more used to seeing from the piloted aircraft of the Red Arrows! 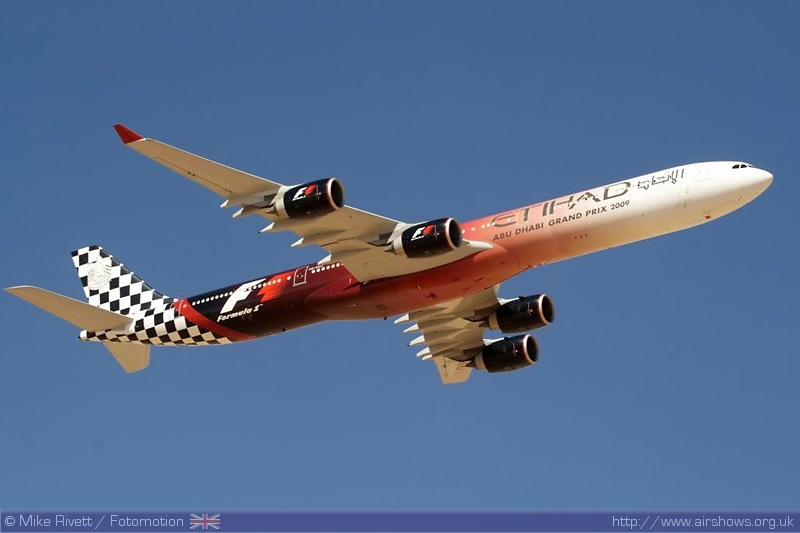 Opening the flying from the full sized aircraft was the A340-600 of Abu Dhabi's national airline Etihad. 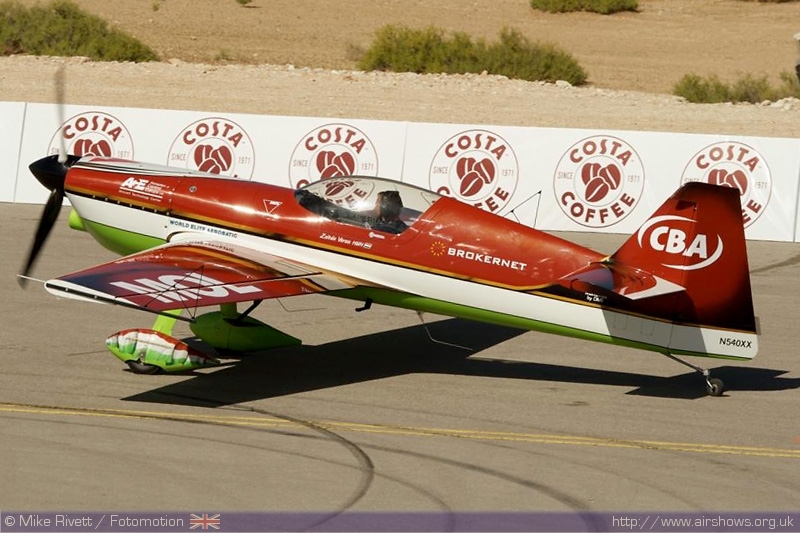 This aircraft had been specially painted to commemorate the inaugural Grand Prix in Abu Dhabi in 2009. 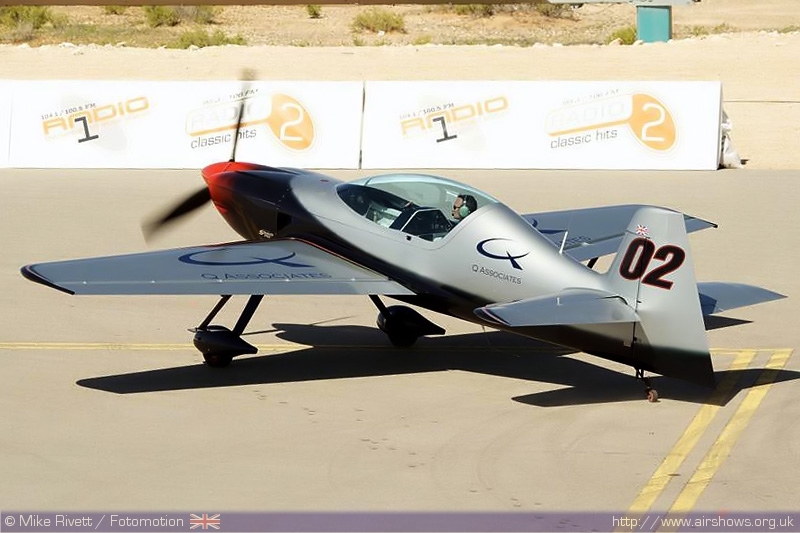 Etihad were also one of the main sponsors and this particularly aircraft made it's debut at last year's show. 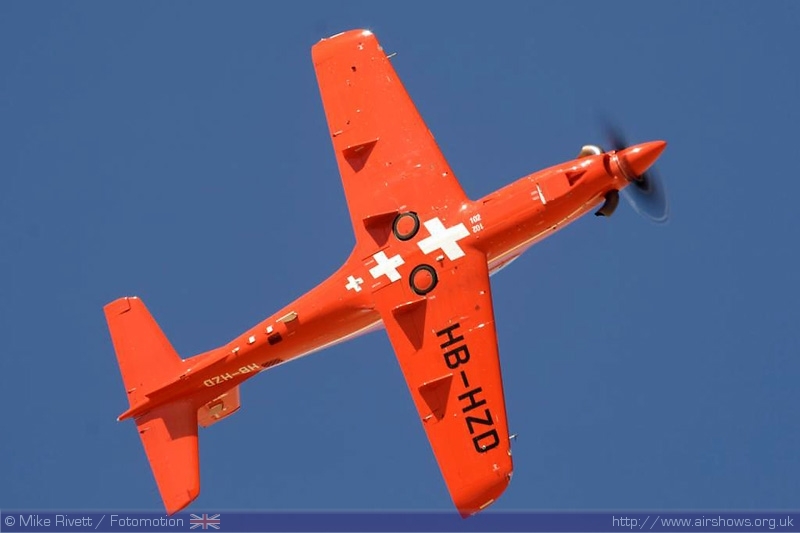 Another sponsor with an aircraft in the flying display were Pilatus. 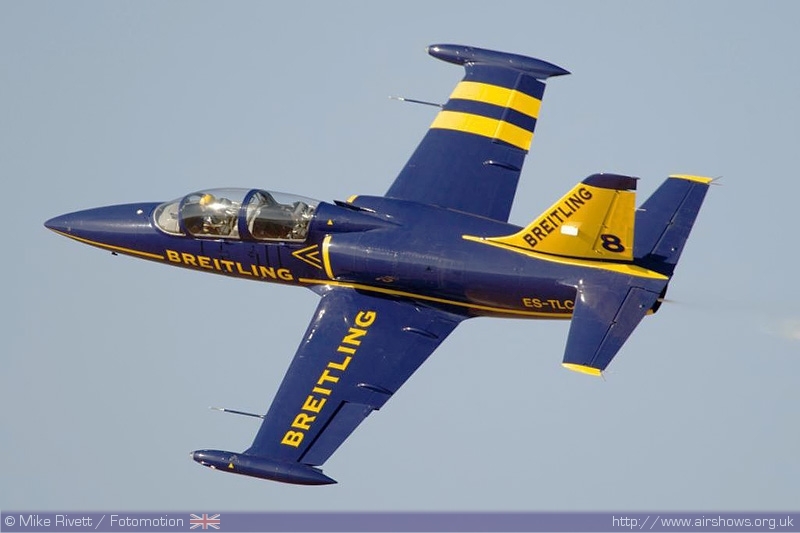 One of their PC-21 prototypes gave an aerobatic demonstration showing why air forces including the RAF are considering it to be the next primary trainer. 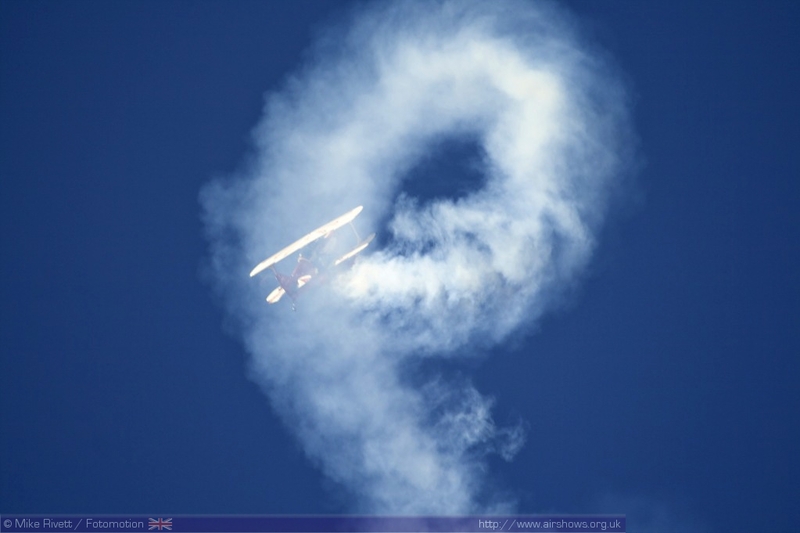 First of the civilian aerobatic displays was Ali Ozturk from Turkey. 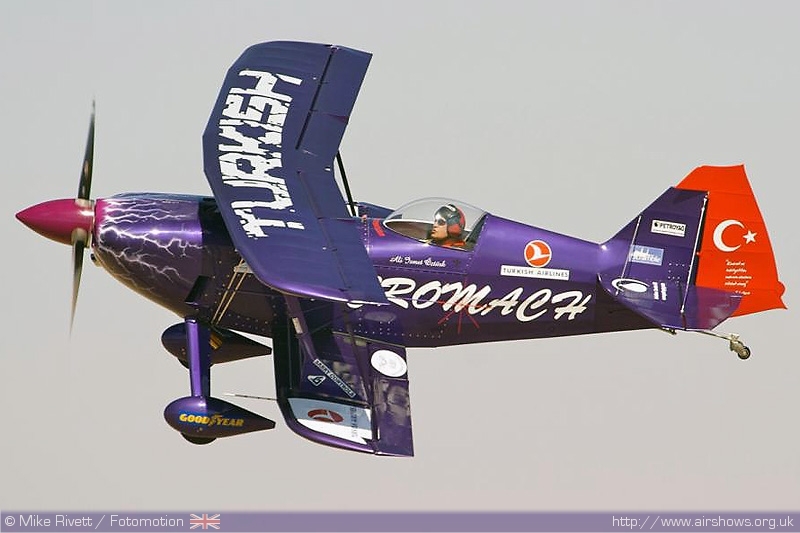 He gave a gruelling display of aerobatics in his highly modified Pitts Special "Purple Violet". 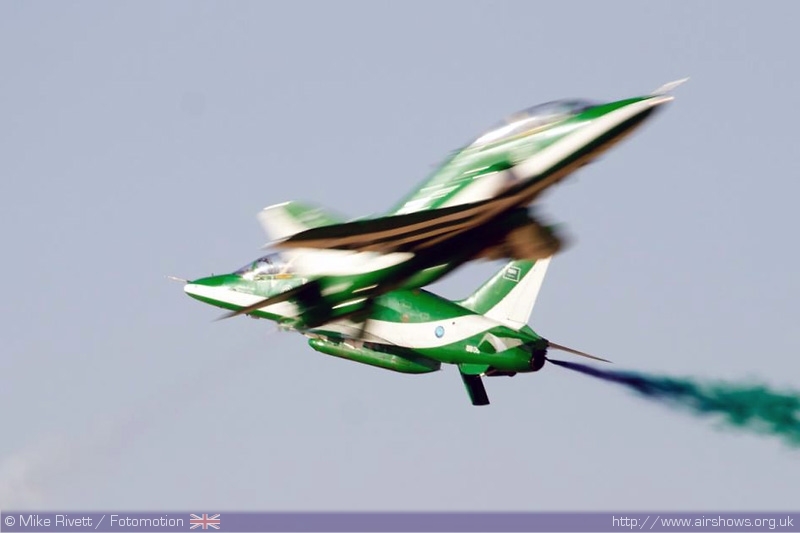 Ali is no stranger to Al Ain and has also displayed in the UK during the 2005 season at the Royal International Air Tattoo and at the Biggin Hill International Air Fair. 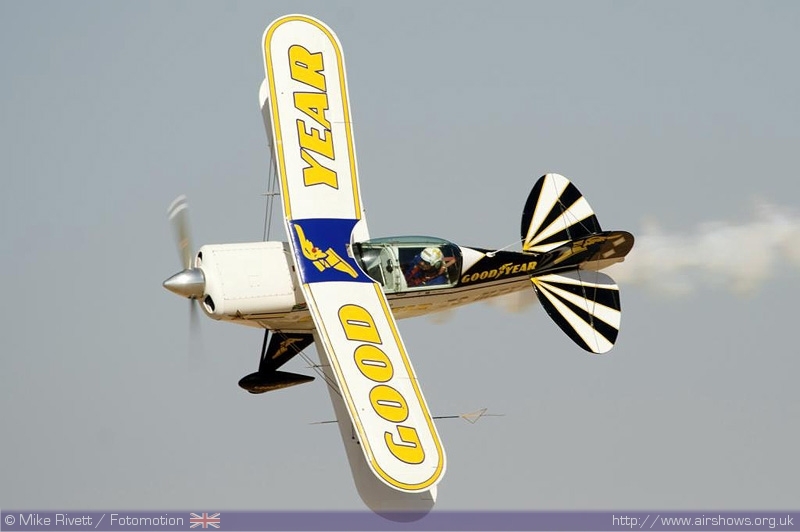 Returning for a second consecutive year was the AERO GP. 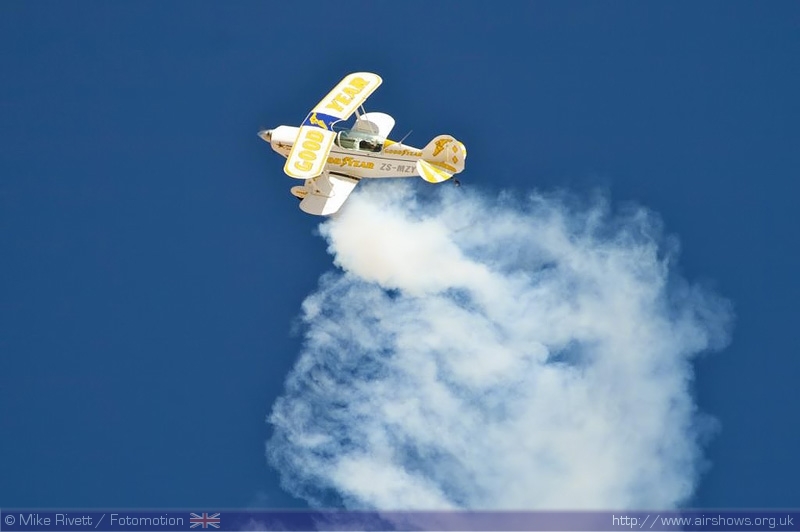 This event sees some of the top aerobatic pilots from around the world competing in three different disciplines to become the overall AERO GP Champion. The first of the rounds was "Dog-fighting" in which the pilots perform an opposition pass before pulling up and trying to get on the opponents tail. The more nimble and slower aircraft have the advantage in this round, as the best way to win is to cut inside your opponents loop. Once on the tail, the attacking pilot must stay there for 3 seconds and call "Guns, Guns, Guns!" If successful, smoke appears from the losers to signal the end of the fight! 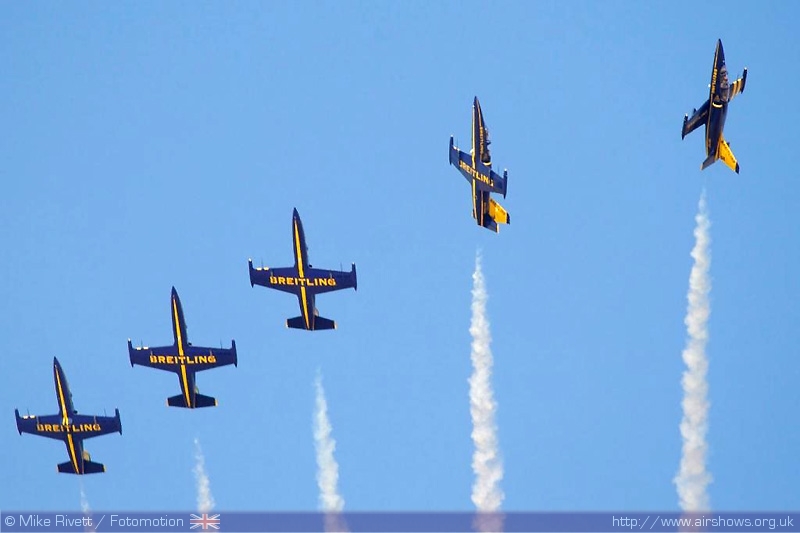 The second round saw the pilots flying a freestyle aerobatics routine to music of their choice, alowing pilots to show off their individual aerobatic and composition skills. 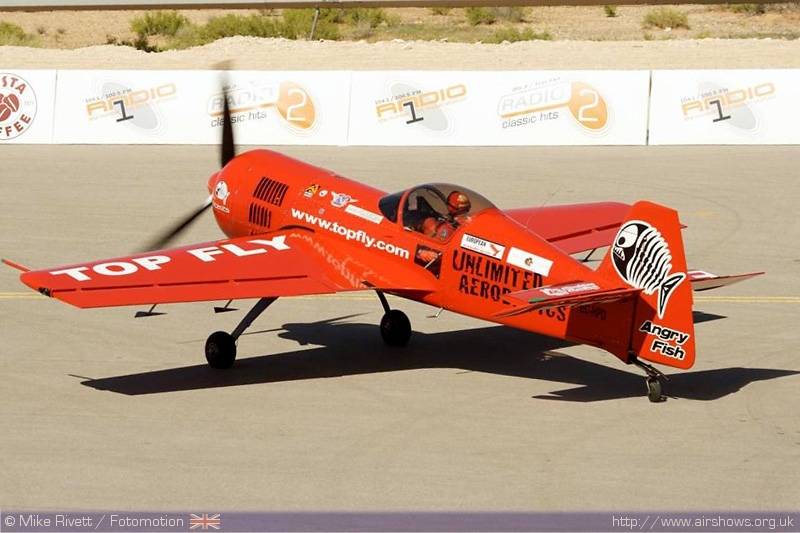 The final round of AERO GP saw all 8 aircraft fly a traditional pylon race, as seen at Reno. The pylons are inflatable pillars spread out across the Desert. The pilot with most points starts at the front while the pilot with the least points starts at the back of the "grid". The race lasts for 10 laps before the winning pilot takes the chequered flag. 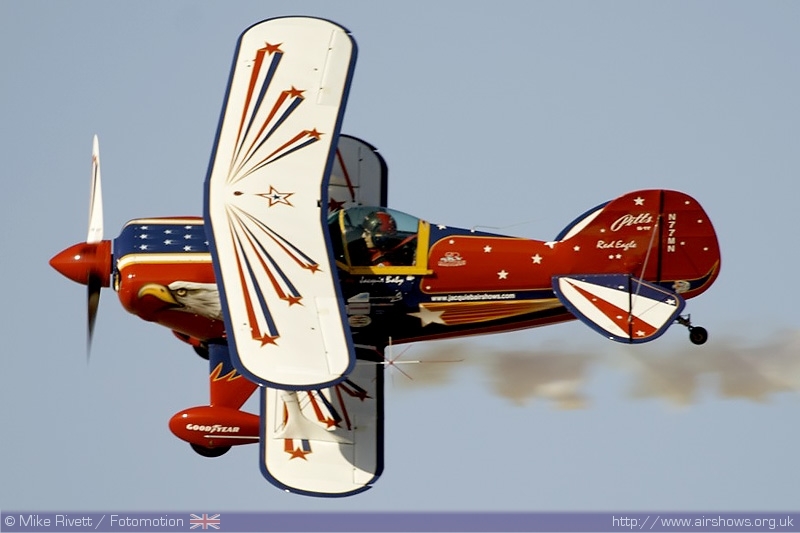 The second of three Pitts Special based display came from American pilot Jacquie Warda. Jacquie didn’t start display flying until she was 50 and proves age is no object as she put the aircraft and herself through an impressive display. 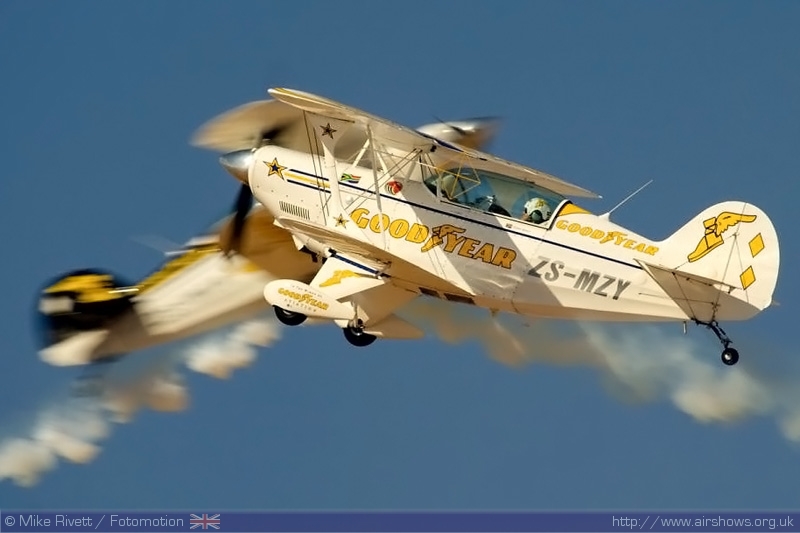 Rounding off the Pitts Special displays were the Goodyear Eagles from South Africa with their three aircraft. 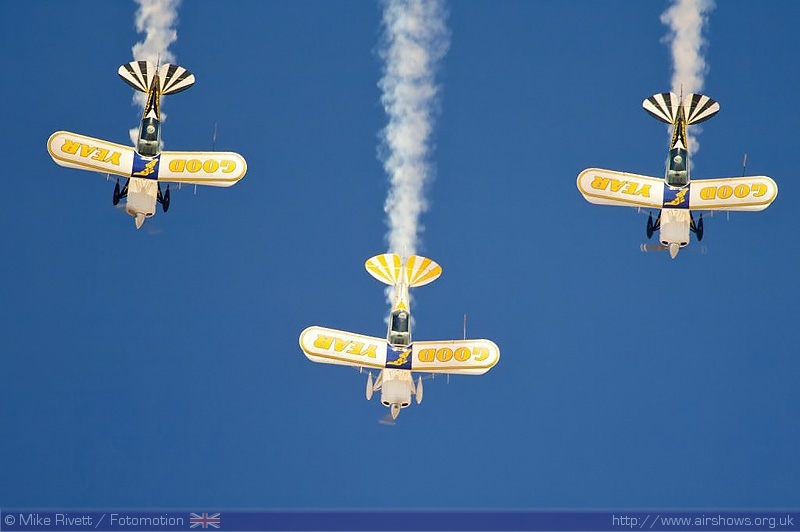 The start of their display is one of the most unique in the airshow world. 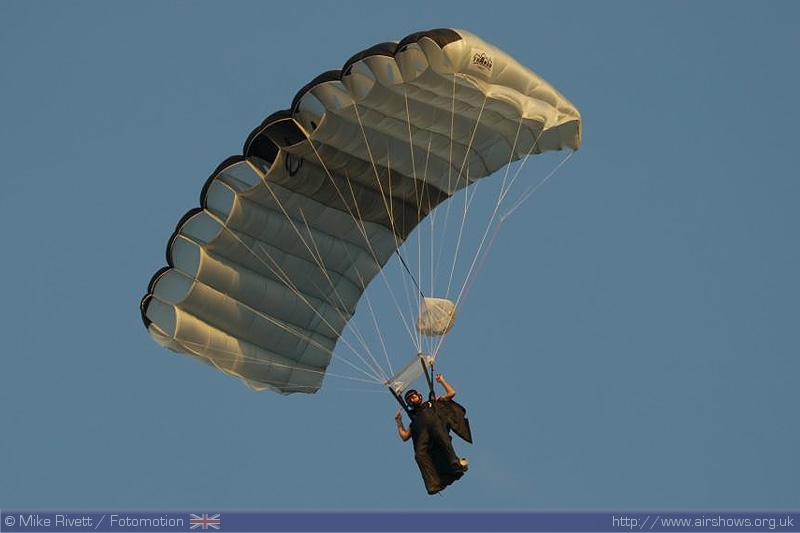 As they pull up to a loop in a loose formation, they drop a parachutist whilst inverted. 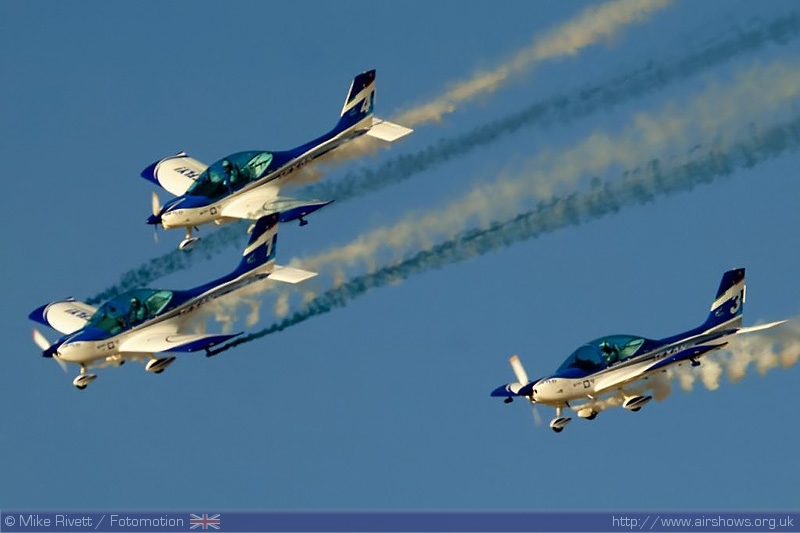 As they fall to the ground, the aircraft land and refit thier canopied before flying a fantastic show of synchronised aerobatics, both individually and in the formation. Performing opposition passes and alike, there is always something for the crowd to see. We can hope that this team visits the UK very soon. 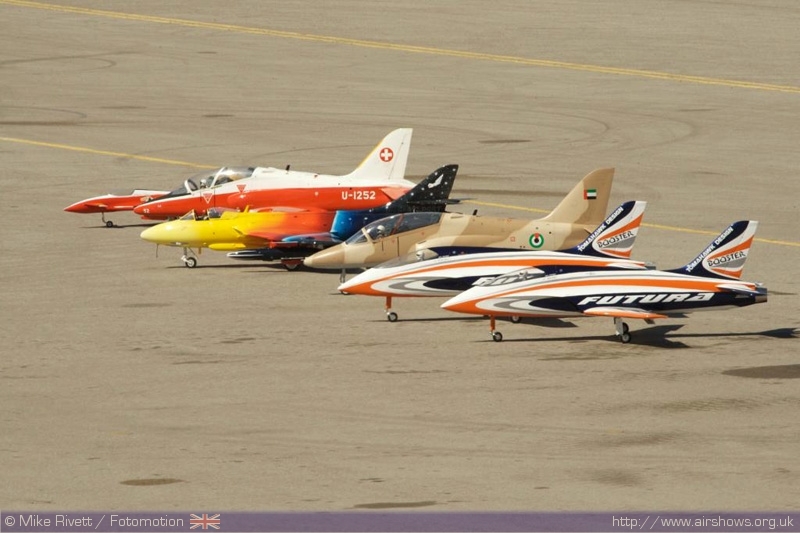 >Another very unique display was the Wefly Team from Italy. 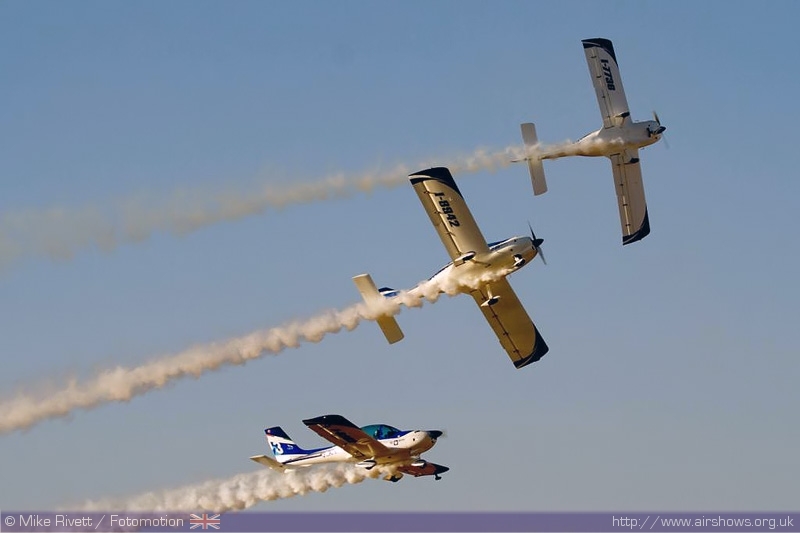 The team consists of disabled pilots who fly a close formation in their Ultralight aircraft. All the pilots are wheelchair bound but provide a very close precise display, along with a very impressive smoke system. 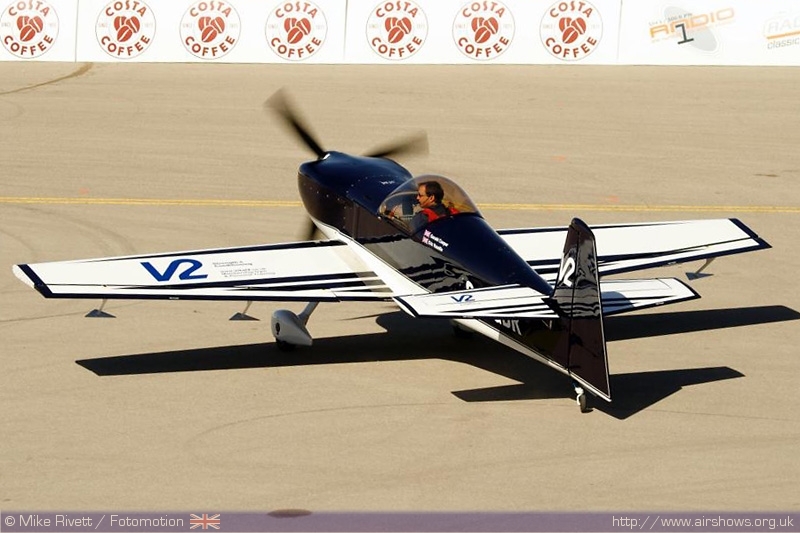 As well as competing in the Aero GP, Zoltan Veres in his MXS gave a fantastic solo display of this aircrafts manoeuvrability. Zoltan currently holds the Guiness world record for executing continuous rolls, his record stands at a huge 408 rolls set at Al Ain in 2007! 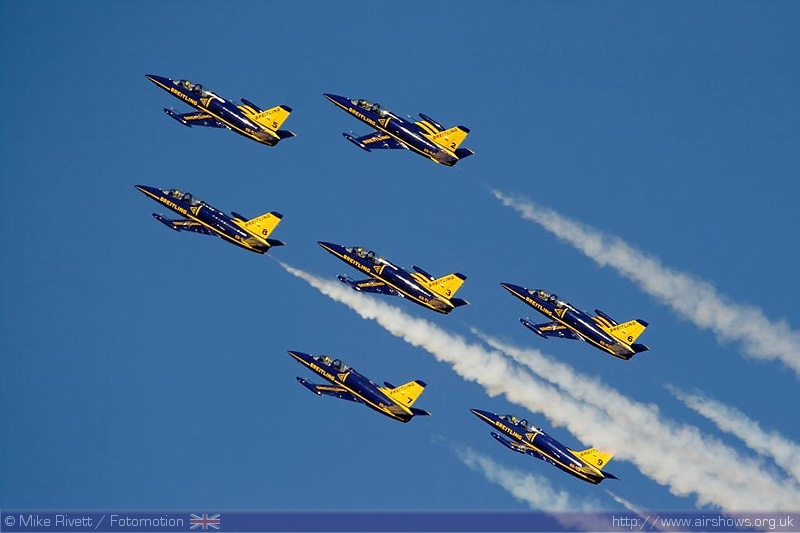 Al Ain attracts top military and civil display teams from around the world. 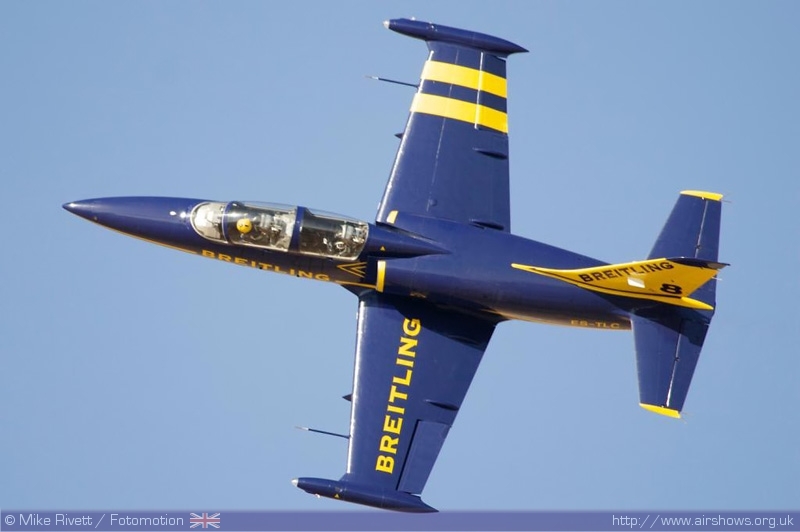 This year saw a distinct "Jet" Theme and topping the bill from France were the Breitling Jet Team, one of only a few civilian jet teams in the world. 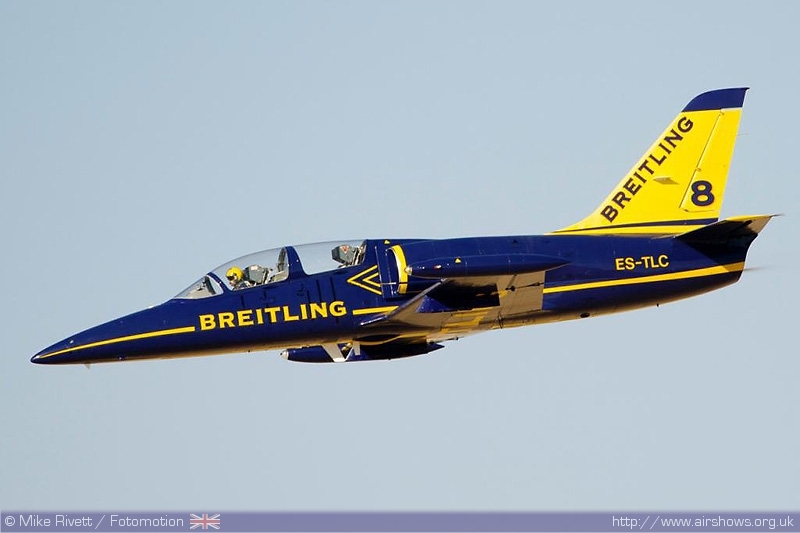 The team flies seven L-39 Albatross aircraft and consists of former military pilots. The only civilian memeber of the team is the leader, Jacques Bothelin. 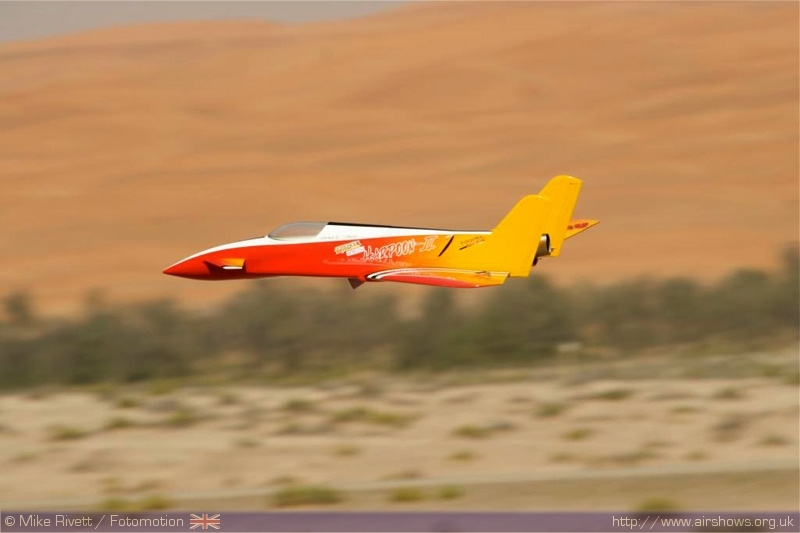 Another civilian jet team were Team Viper from the UK. 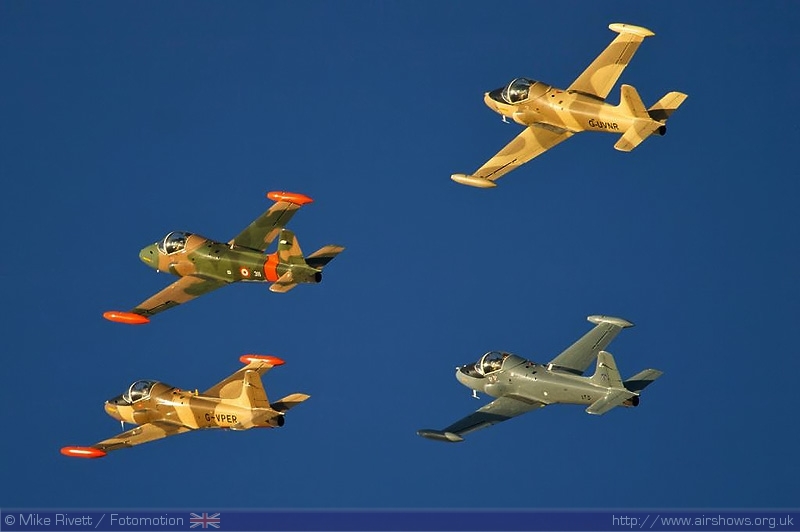 The team consists of four BAC Strikemasters, and for the aircraft this show is a bit of a homecoming, as in their previous life in military service they would have been a common sight in the Middle East, and some Air Forces still use the type! 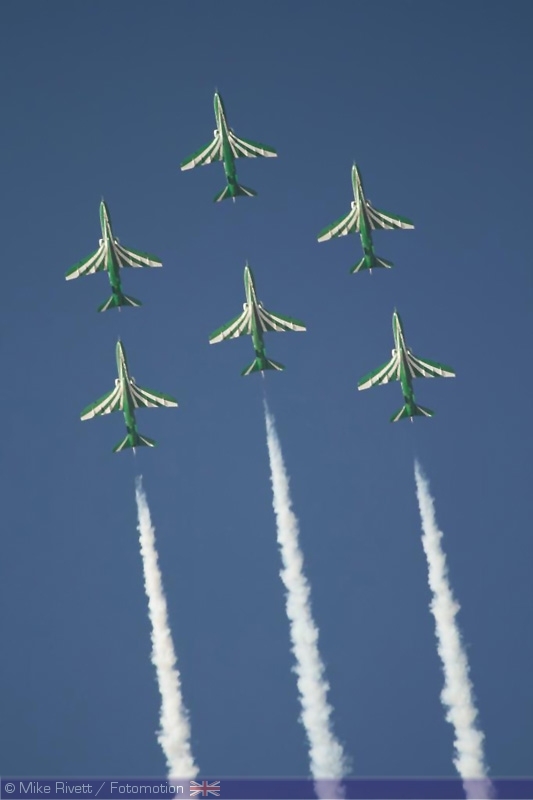 The only military team on display were the Saudi Hawks, a team of 6 BAE Systems Hawks, similar to those used by the Red Arrows. The team have been a regular fixture and favourite at Al Ain. 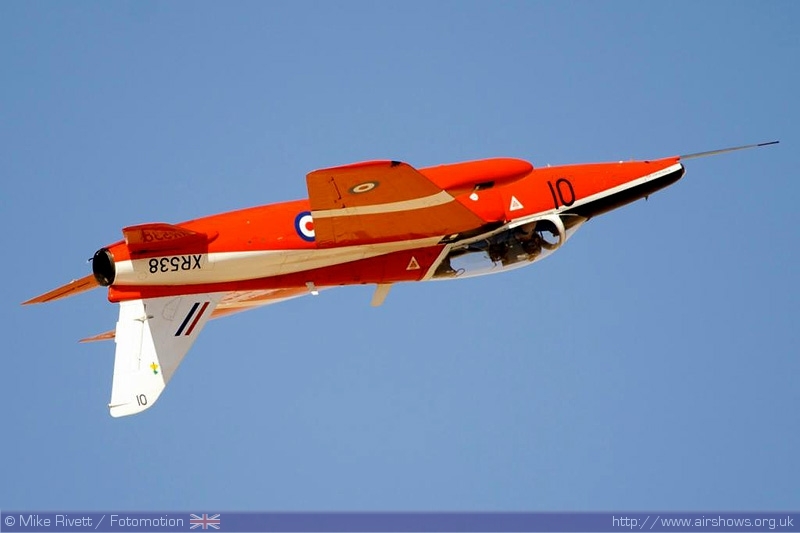 The Saudi Hawks have an adviser from the Royal Air Force which is currently Flt Lt Jim Turner who is a former Synchro Leader with the Red Arrows. You can see the influence with some familiar formations and manoeuvres. Other highlights of the show featured more aircraft that made the long transit from the UK. 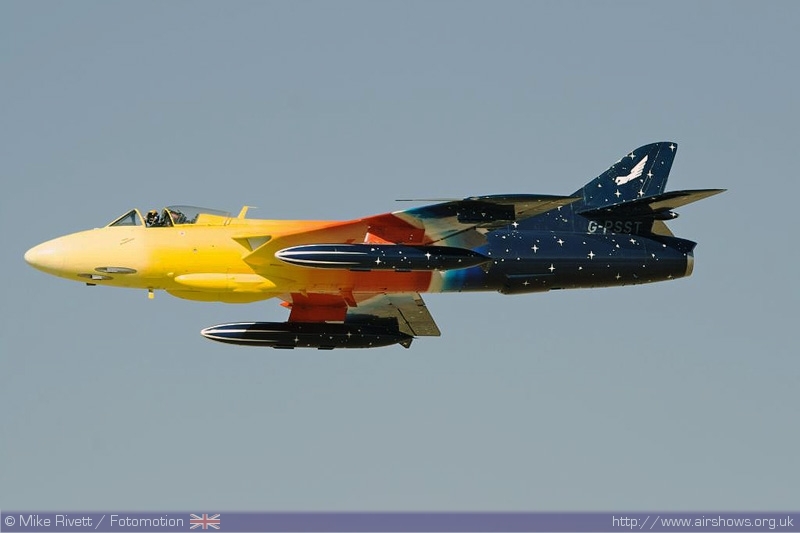 First of these was the full-sized colourful Hunter F58 Miss Demeanour. 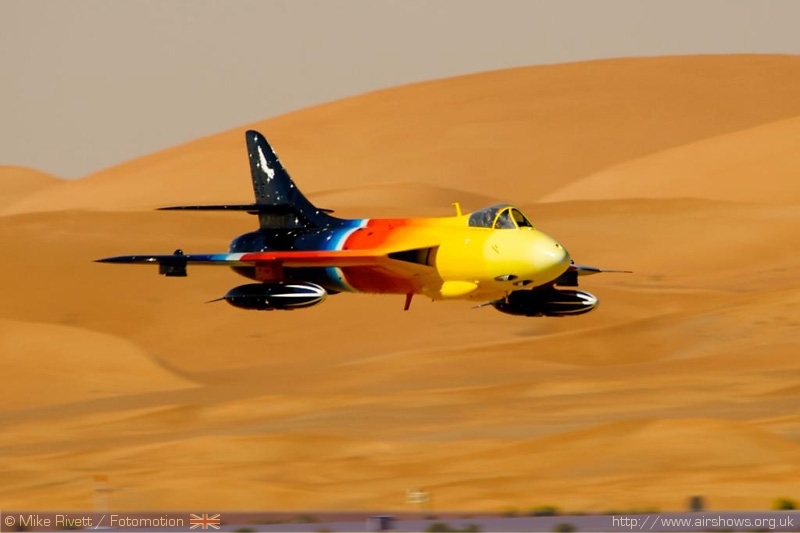 Jonathan Whalley performs a high-energy display in the hunter which included ground exlosions and a final low pass across the Desert. Jonathan also performed his now signature pass where he slows the aircraft down and opens the canopy and waves, something you don’t often see from a jet (Though you have to wonder if he will do it when its raining). Also making the journey were a pair of Folland Gnats from North Weald. 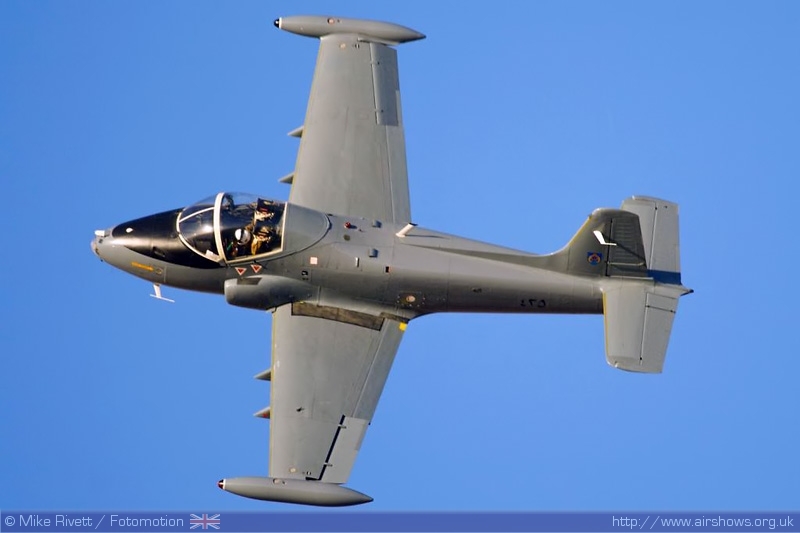 Due to a technical issues only one displayed on the Friday, but gave a great performance showing why this little aircraft used to be very popular in RAF service. 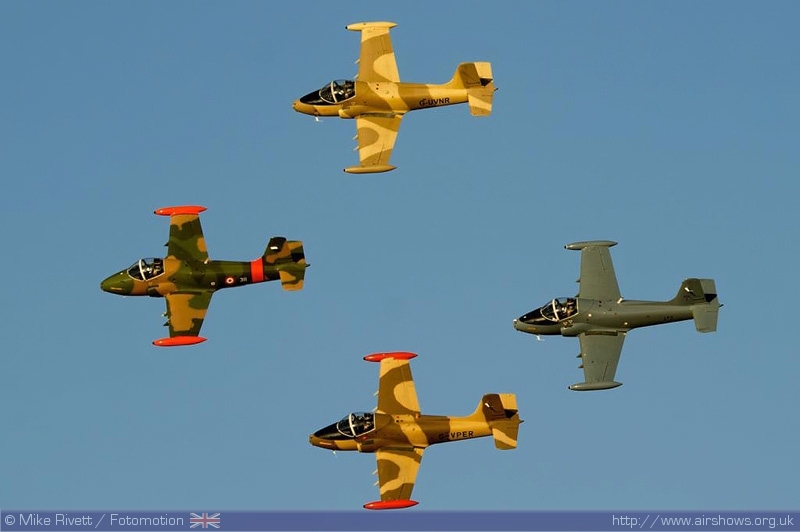 The final British display was a formation of both the Hunter and the Gnat, with a series of formation passes and a mock Dogfight. Jonathon Whalley ended up the eventual winner in that one but further ground based pyrotechnics made it all the more spectacular. As the sun began to set and the show started to wind down, the Dubai Crown Prince Team provided the first part of a very unique finale. 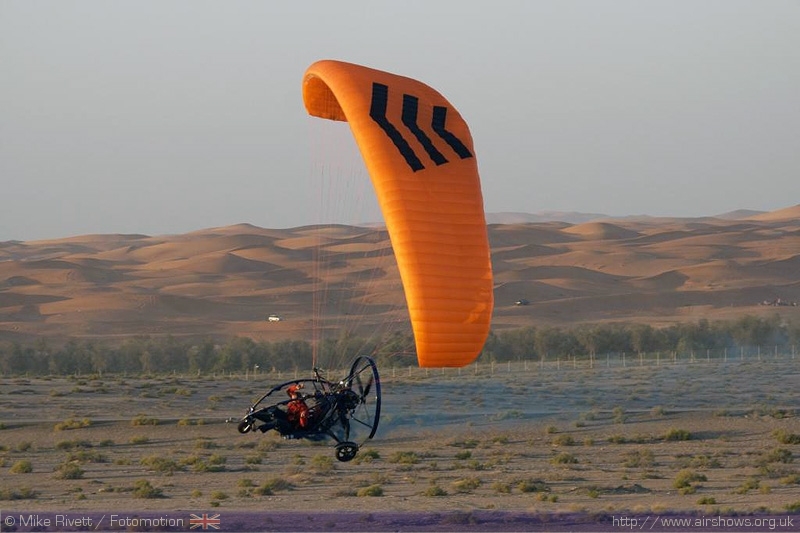 A Paramotor, with a skydiver on board climbed to 5000ft before dropping the parachutist. 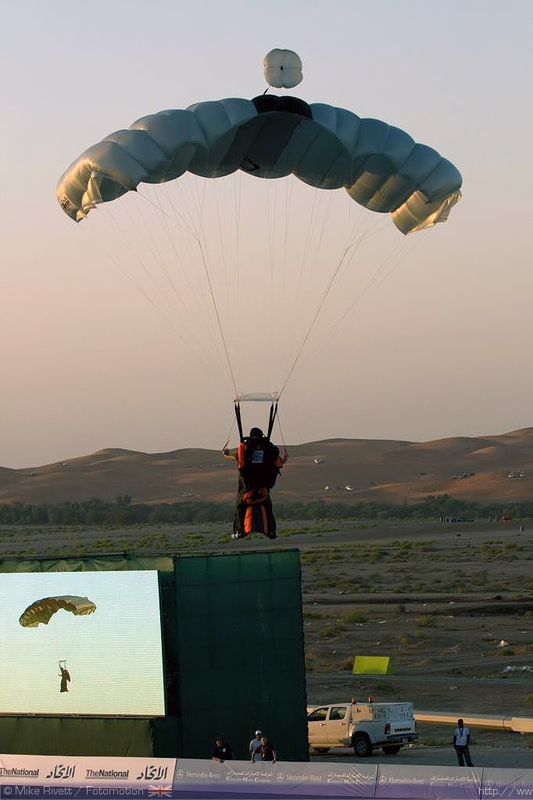 As the canopy opened and glide down to earth, Zoltan Veres was on hand to zoom around it. 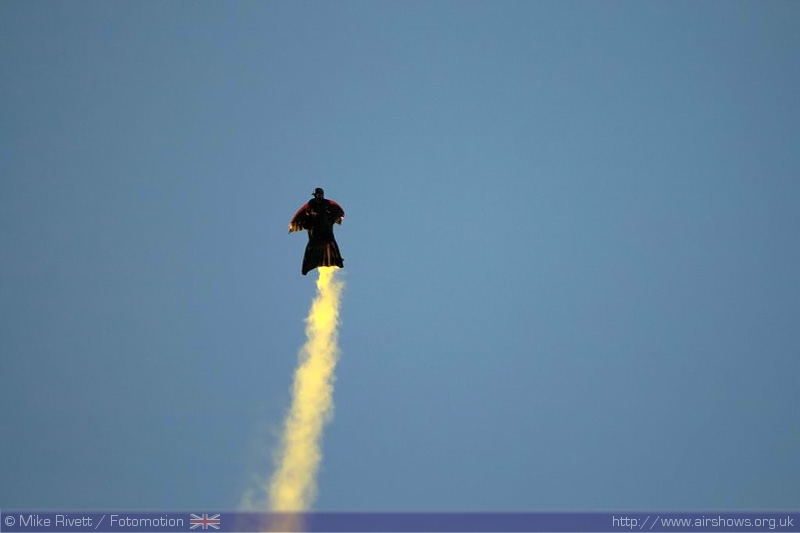 The final item in the show was base-jumper Draz from Croatia and his wing-suit. 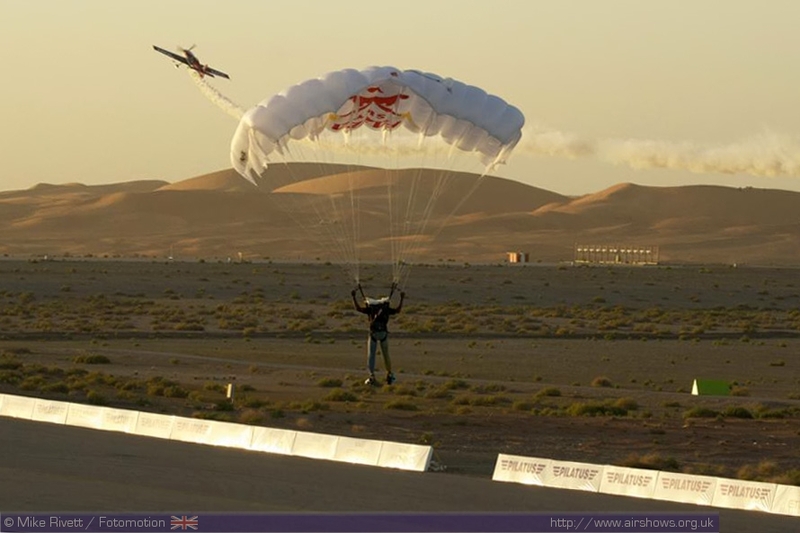 Launching from a microlight, Draz, without a reserve parachute made two “passes” down the crowdline before opening his chute at only 100 metres. Al Ain prides itself on being different; it has a good variety of the best displays acts from around the world - something to please everybody! Every year sees different acts participating making each show unique. It’s a good combination that will keep visitors returning year after year and I expect will see this show grow and grow. Overall the organisation seemed to be good and much improved over previous shows. There were no gaps in the flying display and always something in front of the crowds. Hopefully next years show will be just as entertaining and I’m looking at my travel diary already!